The book starts out as a second-year course of mathematical analysis for honors undergraduate students. It treats rigorously multi-variable differential calculus, Lebesgue integration (via an accelerated approach due to Daniell, treating integral first and measure later), differential equations and vector calculus. The second half of the book is a path toward more advanced mathematics, including manifolds, complex analysis, algebraic topology, differential geometry and functional analysis. The text provides an introduction to these areas which is suitable for undergraduate students seriously interested in mathematics, and is accessible to students before they start taking graduate classes. Algebraic Topology. Currently, I am most interested in motivic and equivariant homotopy theory, especially in equivariant constructions arising from Real cobordism in both categories. I also have a long standing interest in rigorous foundations of conformal field theory and string theory, including algebraic approaches to conformal field theory. Here is my colloquium talk at the Unniversity of Michigan in Fall 2016 on derived representation theory and homotopy categorification of $sl_k$. Here is my talk Homotopical Representation Theorey at the Workshop on Equivariant Derived Algebraic Geometry in BANFF, February 2016on joint work with P. Hu and P. Somberg. Here is my talk The definition and K-theory realization of modular functors which I gave during my visit of the Simons Center for Geometry and Physics in Stony Brook in November 2014. Here are my talks The P vs. NP problem The Beauty of Statistical Tests and Regular polytopes at the University of Michigan Math Club . My talk The coefficients of stable equivariant cobordism for a finite abelian group on joint work with Will Abram. My colloquium Modular Functors given in August 2013 at the E.Čech European Center of Excellence at the Charles University in Prague. Here is a link to the Hopf Topology Archive at Purdue. Here is a link to Bob Bruner's Midwest Topology Seminar web page. Here is a link to some of my old teaching. Now featured in the Scientific American. If you ever tried the 15-puzzle or Rubik's cube, you may be interested in the following three puzzles, which were programmed by Paul Siegel, a Michigan undergraduate, as a part of an REU project. The puzzles should run on any Windows32 machine. 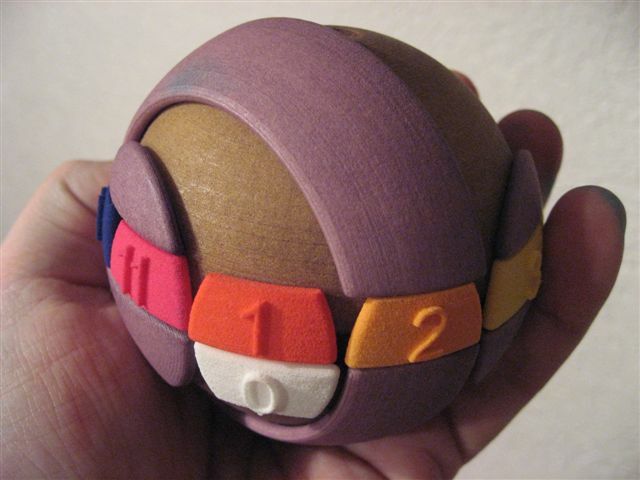 Here is a picture of a prototype of the Number Planet, a mechanical puzzle designed by Oskar Van Deventer and myself, and based on M12. For more questions, please email me. Listen to my home recording of Ricercar by J.S. Bach, the Etude in C major, Op. 10, no. 1 by F.Chopin or the Nocturne in F minor, Op. 55, no.1 by F.Chopin. For more complex music, try the Sonata in B flat major, Op.106, ("Hammerklavier"), 4th movement by L.van Beethoven. For explanation of this prelude and fugue, see this link. Here is my rendition of the Beethoven sonata Op. 109, 1st and 2nd movement and 3rd movement , and my brief essay on the piece. For jazz, try my rendition of Sehnsucht by Brad Mehldau. Here is Beethoven's sonata Op. 111, 1st movement and 2nd movement. Franz Schubert: Sonata in C minor, D958, 1st movement, 2nd movement, 3rd movement, 4th movement. Franz Schubert: Sonata in B flat major, D960, 1st movement, 2nd movement, 3rd movement, 4th movement. Franz Schubert: Fantasy in C major, ``Der Wanderer''. 1st and 2nd movements, 3rd and 4th movements. Visit here for a brief synopsis of the piece. First movement of the Fantasy in C major by Robert Schumann, which was inspired by Beethoven's song "An die ferne Geliebte". Here is the second movement and the third movement. NEW! Here is my rendition of Snowfall by Daniel Kriz. Here is me playing my own pieces Prelude , Serenade, Sad Song and NEW! Spring in Ann Arbor. These pieces are inspired by Bach's chorale preludes, as well as by more recent music. Here is my rendition of Trio super: Nun komm' der Heiden Heiland a due Bassi e Canto fermo, BWV 660, by J.S.Bach and Allein Gott in der Höh' sei Ehr' a 2 Clav. e Pedale, BWV 676, by J.S.Bach. The song is about Matt, a World wanderer. The variations were inspired by John Kiltinen's alternate lyrics to the song, which are about Paul Erdös, "the world's most famous mathematical wanderer". This piece therefore is in part a musical tribute to the memory of Paul Erdös. The piece was originally written for brass septet. I transcribed it for organ (see the score) and world-premiered it at the Northern Michigan MAA meeting in Marquette on October 8, 2010. Sophie Kriz's presentation at the 2016 Canadian Mathematical Society winter conference YouTube video. This page has been visited times since Jan 11, 2003. This page last modified on Feb 12, 2017.